In just a few (hopefully short) weeks we get to move into our new house! Eeee! We are so excited to move in and we can’t wait to get started on decorating and projects. During this agonizingly long waiting period, I’ve already started planning how I want each room to look. (It’s helped the time to pass by a bit faster!) With this new house, I feel like I have a fresh start to really hone my design style and make more permanent furniture and decor choices. I’ve determined that my style is something that I call modern bohemian farmhouse. It’s rustic, it’s cozy, while still remaining modern with whimsical and colorful touches. It has some nice tall windows that we are going to be putting a family heirloom standup piano beneath. I like how it’s kind of tucked away for private dinners, but still feels open enough to the kitchen and living room for when we have lots of people over. 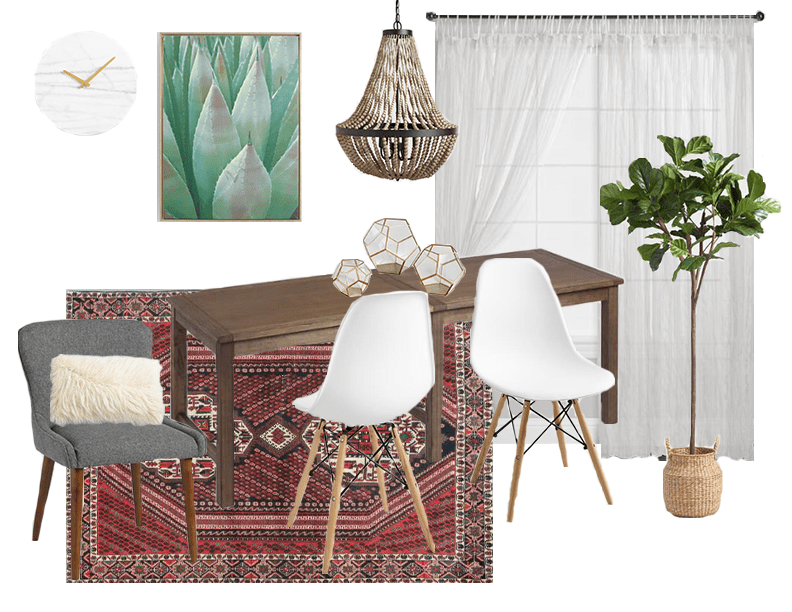 Let me just say that I love love love how this bohemian farmhouse dining room style board came together. The rug, plant life, and artwork bring pops of color and some whimsical old world charm, while the chairs, terrariums, and clock are more modern and the table and chandelier are giving off farmhouse vibes. And yet it all blends so perfectly together, don’t you think? This space just feels so cozy and inviting to me and I can imagine the farmhouse table getting worn from future years of meals spent loved ones and game nights going till all hours of the morning. Now, the one thing about this board is that the rug is tetch too small for this table (but I couldn’t resist using it for the amazing colors and pattern). The solution? Layer a neutral jute rug under it for more rug space and some boho farmhouse texture! Another cool part about this style board that I haven’t mentioned yet is that all of these pieces are from Cost Plus World Market! That’s right! One-stop shopping 🙂 I love how they have so many different styles for furniture and decor pieces. (No, this post isn’t sponsored by World Market, I just love their store so much!). And the best part? 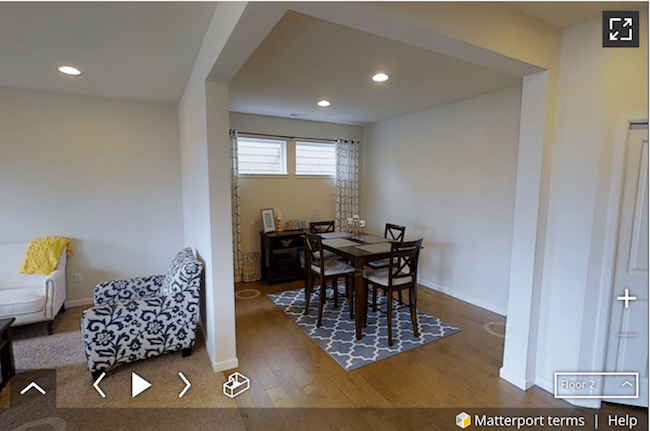 I can get everything to outfit this new modern bohemian farmhouse dining room for less than $2500 bucks. How perfect is that?? If you want to shop this look yourself, you can either click on the links above or the pictures below! What’s your favorite part about this dining room style board? Are you digging my modern bohemian farmhouse style?? 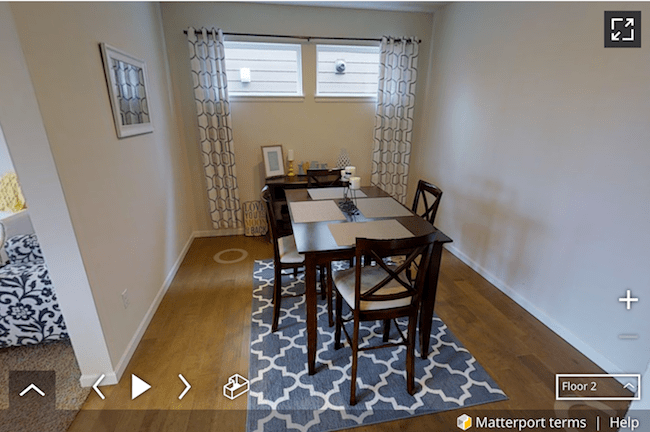 I love the look you’ve pulled together for you new dining room! That rug is simply gorgeous. Have fun decorating your new home, it’s such an exciting time!